Adding a new product to your store is simple and only takes a few minutes. After logging into your Selz account, you will be taken to your dashboard. From the left navigation panel, click Items > All > Add an Item and then select whether you will be selling a Physical, Digital or Service item. Once you’ve selected the type of item you wish to sell, choose a title, description, price, and quantity. Here’s where you can enable Pay What You Want or choose to show an “original” price along with the price you’re currently selling for. If you are selling a service or physical product with a custom unit (ex. $25/hour or $15/yard) you can set that up with the custom units feature. Here is a sample service listing for a lesson at $100/hour. Make sure your item description is clear and easy for buyers to understand. Describe the benefits and uses of the product. Add images, or a video/audio clip, so your potential buyers have a clear idea of what you’re selling. You can add up to 8 images and 1 video or audio file. You can also embed straight from YouTube or Vimeo simply by pasting a link. Go through the tabs at the top of the page. Click on Categories first. The default category is Featured but you can add more categories to your page too. Mark the box next to Featured to see the items on your homepage automatically and learn about adding additional categories here. 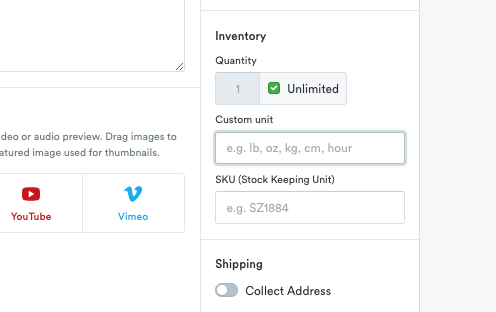 If you are uploading a physical or service item, you will see a tab called Variants right next to Categories. 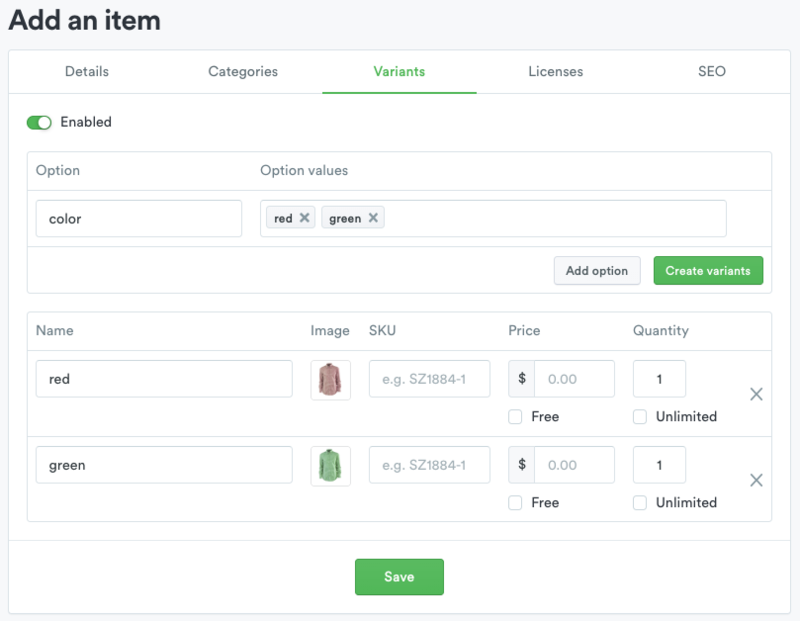 Here you can set up product variants like colors, sizes, and type. Learn more about setting up variants here. Select the next tab to the right, Licenses. Here is where you can set up license keys for apps, software, themes and other digital products. This feature is only included in our Pro Plan. For more in-depth information on license keys, click here. Get your product found more easily with SEO (Search Engine Optimization) Add a page title, meta description, and custom URL for your product under this tab. Click here to learn how to make your Selz Store SEO friendly with meta descriptions.